This 18 inch Star Solid Fuel All Night Burner is a fire grate kit. 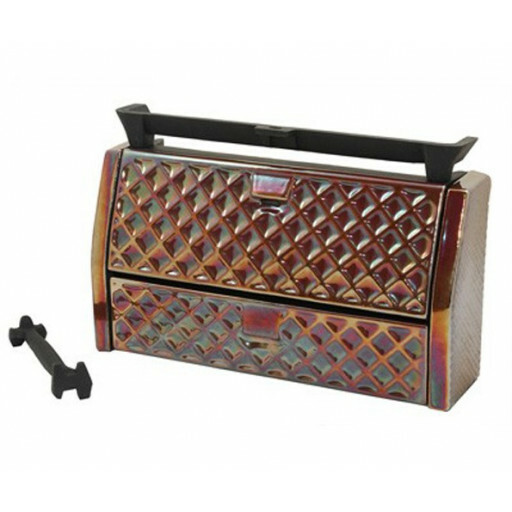 It comes in a solid high gloss enamelled brown colour and the front is made of cast iron. This all night burner fits into any standard 18” or 458mm clay fire back. The fuel used for this product is either coal or wood. The complete package includes the grate, the ash pan, the operating tool, and fret. The grate is called the Queen Star grate. The grate is 229mm depth from the front to the back. The front of the grate measures 406mm wide and the back measures 305mm wide. All night burners allow you to have greater control over the size of the fire. All night burners work by restricting or increasing the amount of airflow to the fire through the ash pit cover. More airflow allows the fuel to burn faster, which makes the fire hotter and brighter. With less airflow coming in through the cover, the fuel burns slower and the fire lasts even longer.